Thanks for all of your responses yesterday. I loved reading your feedback. Thank you, Thank you. I know, there’s only a few days until the 4th of July this weekend. But here’s a fun little project you can do last minute. 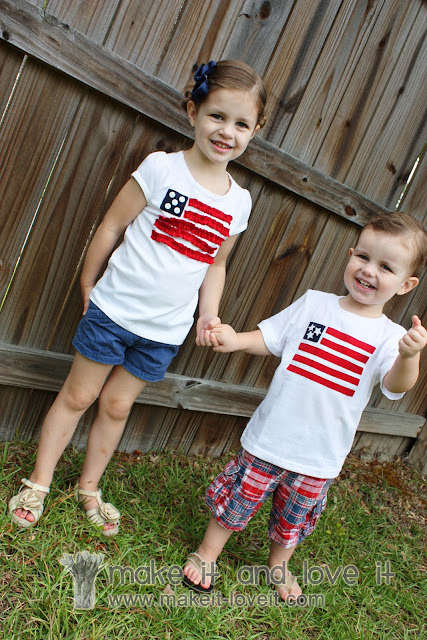 Little 4th of July shirts. And a little more ruffly for a girl……..
And smoother lines for a boy…….. Together, they make a sweet pair. First, to make the little ruffled girly flag…..I cut up an old red tshirt and made strips out of the knit that were 1/2 x 12 inches. Then I decided how wide I wanted to make the flag (about 6 1/2 inches wide) and placed pins at each side. Then I layed the strips down, just how I wanted them from the left side, and let the tails hang over the right side for now. Then I made a pencil mark at the left side of each strip and the right side of each strip, 1/4 inch down from the top of the strip (so the line would be centered down the center of each strip). And then I made a straight line with my pencil. I did that for each strip so I would know exactly where to lay each strip after I ruffled them. Make sure your pencil lines are exactly as long and spaced exactly how you’d like it……so that placing the ruffles will be easier. Then sew each ruffle in place. Then I cut a blue knit square (again, from an old tshirt scrap) and sewed it right to the shirt. Then I sewed five little buttons onto the square. The more girly flag is now done. Onto the more plain flag. I first ironed on some Heat ‘n Bond (double sided adhesive) to a big chunk of the red knit. (from the old red tshirt I used above, remember?) From that, I cut strips of red that were 1/2 x 6 inches. Then I peeled off all of the paper backing and layed each strip on the front of the shirt. I added some Heat ‘n Bond iron on adhesive to a little blue square as well, and placed everything just where I wanted it. I also attached some of the same Heat ‘n Bond to the back of a white square of fabric (it was actually the pocket that I picked off the shirt), then traced some stars onto the paper backing of the adhesive, cut them out, then added them to the blue square. Then I ironed everything in place. And pretty inexpensive. And yes, I know you can buy little flag shirts everywhere for about $5…….but they aren’t nearly as cute/fun as making your own. Perfect for the 4th of July weekend. « You ready for a long one?? I took your argyle shirt pattern you did for your little boy and made some for my boys with a red white and blue theme. I love them. Thanks for all the great ideas! SO cute! Thanks for all the fun ideas!! I have been planning to make a shirt for my daughter, but this is much cuter than what was in my head. Thanks! These are so cute. I was looking for a fun outfit for the 4th. Thanks! LOVE it! You just changed my life. I was going to make everyone matching Lil Blue Boo stuff. Now, I am going to do yours. This is EXACTLY what I wanted! LOVE YOUR BLOG! How creative and super cute. Thanks for all of your fun and affordable ideas! This is absolutely what I was looking for. I was going to try to do the upcycled hoodies for my kids and their cousins but, I LOVE this idea so much more! FANTASTIC! These are too cute for words! Thnaks so much for sharing, can't wait to make my kiddos some! Is it pathetic that I want to make the ruffly shirt for ME? No, it’s not! I was thinking the same thing! The shirts are adorable. But the kids… they are so cute!!!! Thanks for sharing. ok, so my boys are getting one each. IF i find time to do it…i'll let you know if i post pictures. 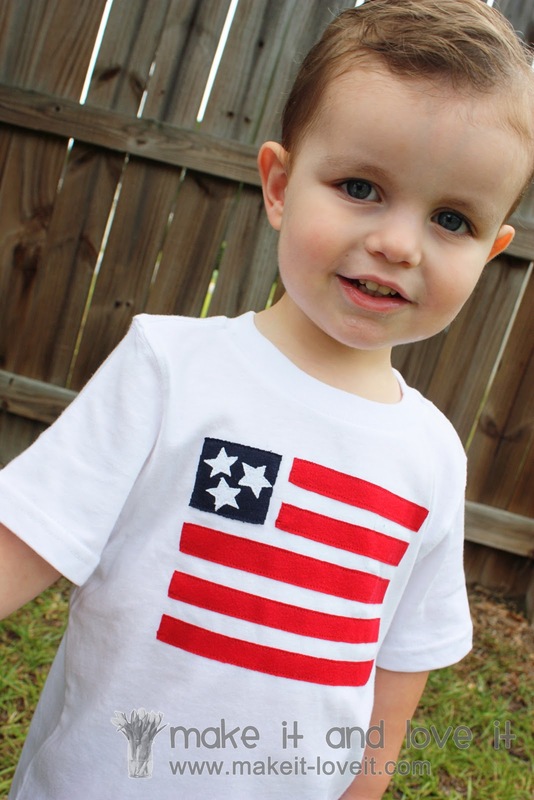 i love these shirts I might have to make one for my lil guy! I just may have to make these! What a fun idea! Thanks so much! these are sew adorable! I love the boy and girl versions! Those are so adorable and so easy! I can't wait to try them out. You just inspire me every day! Thanks so much for the adorable ideas! Love!! I've been trying to figure out what to make for my daughter to wear this weekend! Thanks for yet another great idea! Adorable. Thanks for such great ideas. What a cute idea! Now, if only I had time to whip up a few before the holiday weekend is upon us. :-) Maybe next year. Great job though! I love these! Sooooo cute!! I might have to do this to go with my little girls tutu!! You did it beautifully! And I love the boys version as well. Fantastic! I am so making these for my girls. Thanks for the tutorial. I wanted something just like this. These are darling! I love both of them. Thank you for sharing your talents with us! Love them! your kids are adorable!! I love your blogsite too! LOVE this…I am making it today. THANKS so much! So stinkin' cute! I'll be linking on Saturday for sure! Thanks for the inspiration! I made a similar one for my daughter this evening :) Instead of buttons I hand sewed little stars onto the blue knit patch. It turned out cute! LOVE the blog, as always!! These are adorable! I'm wondering if I have enough time to make one for myself today. . . This is ADORABLE!!! I'm going to put this on a little white sundress for my daughter today! One question I've had about sewing t-shirts… How on earth do you sew around those tiny little stars without accidentally sewing through the back? I just can't figure this one out! This is such a cute idea! They turned out really cute!!! smileynann – I used double sided fusible web and ironed the stars onto the shirt and then I stitched around each star with my sewing machine. So I sewed through all of the layers. Does that make more sense? Let me know if you have more questions…. here is the link to photos I took of them. I linked it back to you too. Thanks!!! these are so adorable! your little ones are too cute, as well! thanks for an awesome blog! So sorry, I still don't understand… So, I get that you sew through all the layers of the stars and background and shirt, but I just don't see how you can sew the pieces onto the front of the shirt without going through the back of the shirt. Those shirts are so TINY! And the neckholes are so small. So, I just don't quite know how you sew through the front of the shirt without accidentally catching the back side as well. AHHH! I am too cheap to buy shirts like this beforehand, and never remember to buy them a size bigger on clearance – why didn't I think to make them??? Very cute – and I love how they're so different yet coordinating. (Mine would never look this good anyway, but a girl can dream!) I linked to this on my weekly roundup – thanks for sharing! PS – I also linked to the cloth baby rings and sewing machine cover. I have a friend that's due with baby #2 in about a month and I'm on pins and needles to find out if it's a boy or girl so I can make some rings!! These are SOO cute! I am definitely going to make some for my girls. Thanks for sharing!! So, cute, and at least they won’t look exactly like everyone else with the WalMart or Target 4th of July shirts. what a neat sewing project! 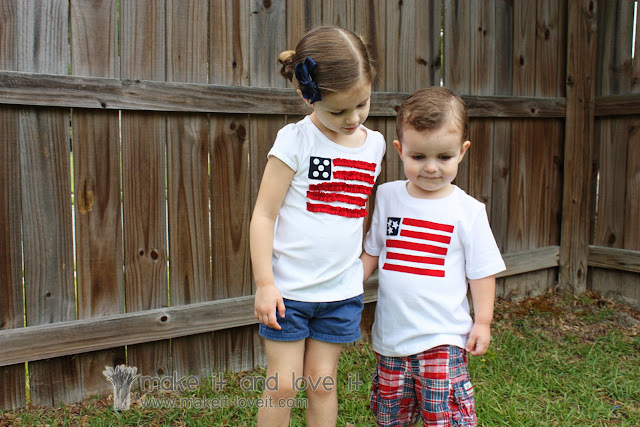 Thanks for the flag tee shirt idea. It is so cute! I am going to make it for my granddaughter. Thanks! I absolutely LOVE these shirts!! And have been waiting for this holiday to give it a try since I discovered your site in January. But I need your help!! I’ve perfected the boys shirt and have made 4 (3 for nephews, and 1 for my son). But I’m now onto the girl shirt for my 4 yo and I can’t get the knit fabric to gather nicely. It ends up twisting into a spiral and I can’t get it to lay flat without taking most of the gathering out. Any suggestions so I can finish this up in the next two nights?? ACK!! Totally going to go pick up some plain white t-shirts! c’est une très bonne idée, j’adore ! I love this! for sure making this next year!!! 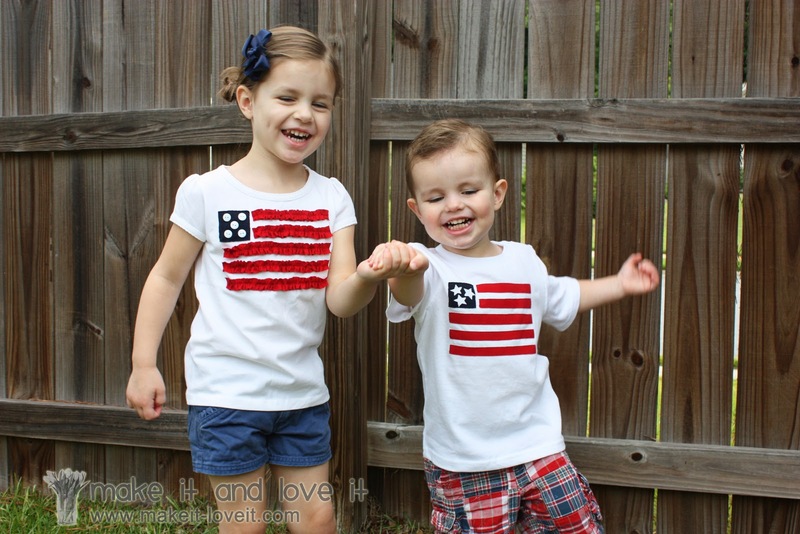 I just decided against buying the Old Navy flag shirts… yet! Now, I see this and it is sooooo much cuter! I have twins coming and a bunch of white onsies that I feel bad returning. Now, I know what to do with them! Thanks for the tutorial you wrote sooooo long ago. Thanks to Pinterest old posts are becoming new! Thank you so much for sharing this idea. I made 7 of them for my grandkids; 1 girl, 5 boy, and 1 onsie. They turned out so cute and I am very pleased with them. You are the best! :) I handle such info much. I was looking for this certain information for a very lengthy time.